Steel crossover / gripper ring belly rings set with an 8mm Swarovski Crystal that are truly stunning. 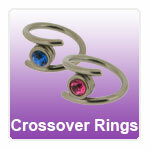 Cross Over Rings are suitable for vertical navel piercings, and are also useful if you have a slightly "wonky" piercing! They also look great in ear piercings. The centre retainer simply pushes in or out of the spiral and clicks into place - much less fiddly than BCR's and very comfy to wear.